Anyone else want a Trail Stand sent Priority today? I believe you mentioned it beats the heck out of a $200 centerstand that weighs 11 lbs, I have to agree! and he has a real time gps location device along to show their progress, gettting close to the British Columbia - Yukon border headed to Alaska! Lookin' forward to add this to the "kit" on my 2008 KLR. Hope to never have to use it with my own bike.... though I will enjoy pulling it out when a riding partner starts to freak out with his "flat" out in the boonies. Yep it will make your life easier when the dreaded flat occurs, on yours or anybody else's bike. Thanks for your order, it's on the way Today! Hey Dudley, your Trail Stand is on the way. 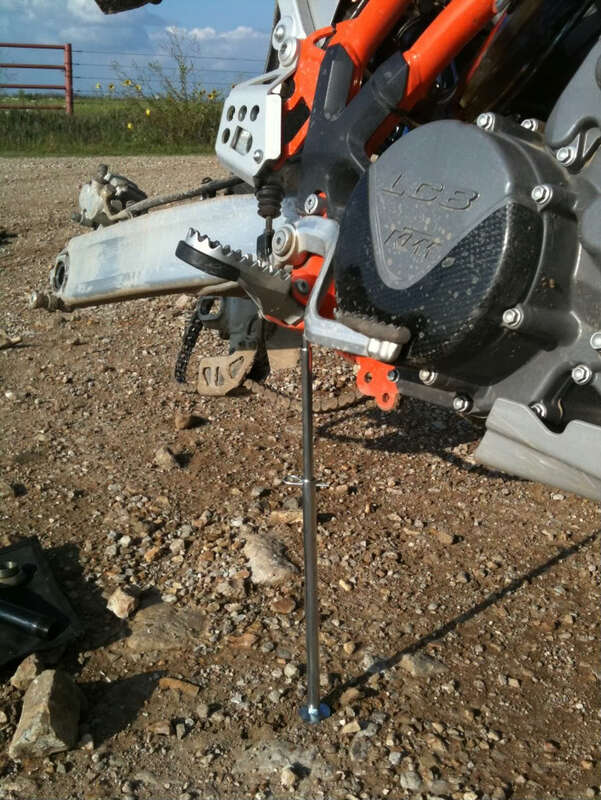 The Trail Stand itself is very strong, it is made entirely from steel, for instance the Hitch Pin type cotter pin, according to my somewhat conservative calculations, should take over 700 lbs to fail. The cradle will bend down slightly with large loads but it stops when it touches together. What I can say is while I was lifting the rear wheel of my Husky TE610E I stood on the footpeg. I weigh about 205 (really) and I'm guessing about 50-70lbs of the weight of the bike. So I would say that a working weight of 250 lbs is a reasonable rating. Most of the weight of the bike will be on the wheel on the ground and the kickstand so remember if your putting 250 lbs on the stand then your lifting 250 lbs, I don't know about you but I wont be doing that anytime soon. I believe the failure point of the stand is significantly higher but if were talking a safe weight I would max it out at 250. I will do some more testing and update this figure as necessary. I need to post a pic of me standing on the footpeg with the stand under me. Order placed after seeing your post in the Mobius Trip thread. It's on the way, thanks for the order! The Mobius trip thread is a great thread, even better with the riding video intermixed with the photo's and writeup! Received mine yesterday and it looks like a lot of thought went into the design and build. Hopefully I won't need to use it. Received mine today. Thanks for the fast shipping. Thanks Dudley, your correct, I spent a lot of time designing it the Trail Stand to be usable, compact, packable and easy to manufacture to keep the price down while building it in the middle of the USA. And of course thanks for your order! 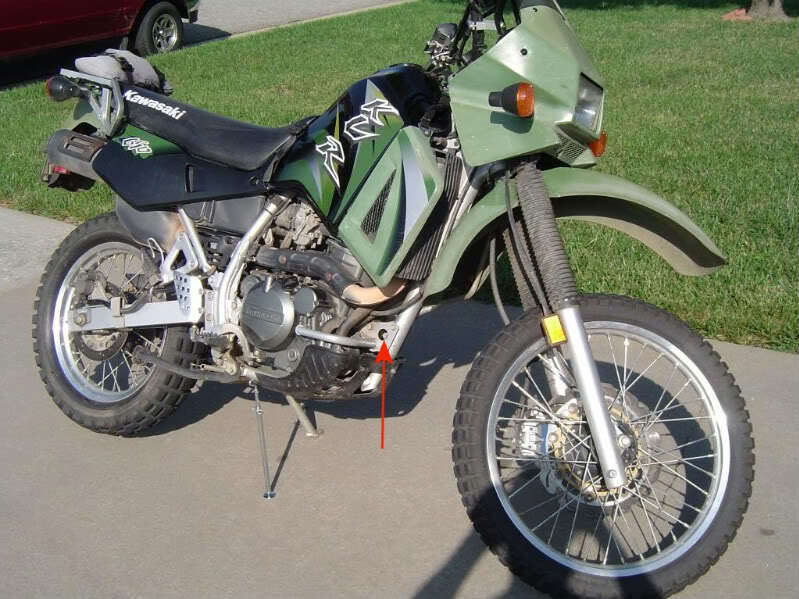 Here's a pic of the Trail Stand lifting the rear wheel of a KLR650, Since it has a plastic skidplate I have lifted the front wheel using the engine mount the arrow is pointing to. It's a little more difficult but can be done. 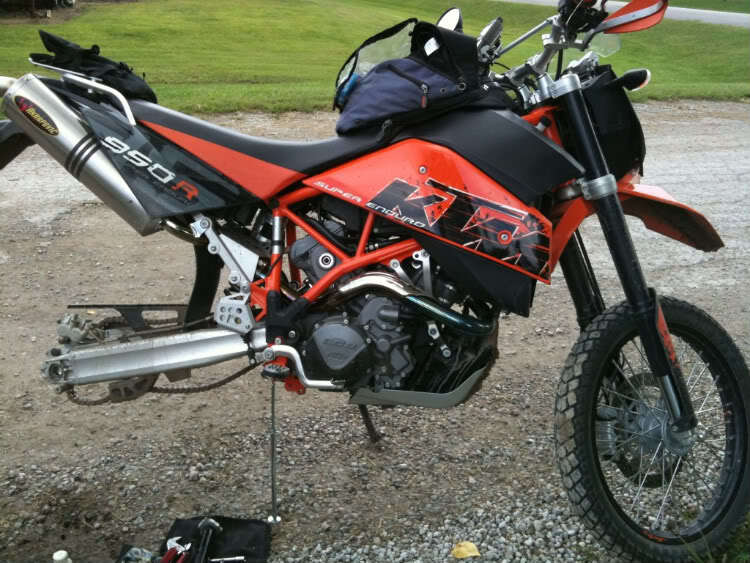 I was asked about a 2009 KLR650 but don't have any pics of that, I'm confident it will lift the rear wheel, just not sure what is available on the newer KLR to lift the front. 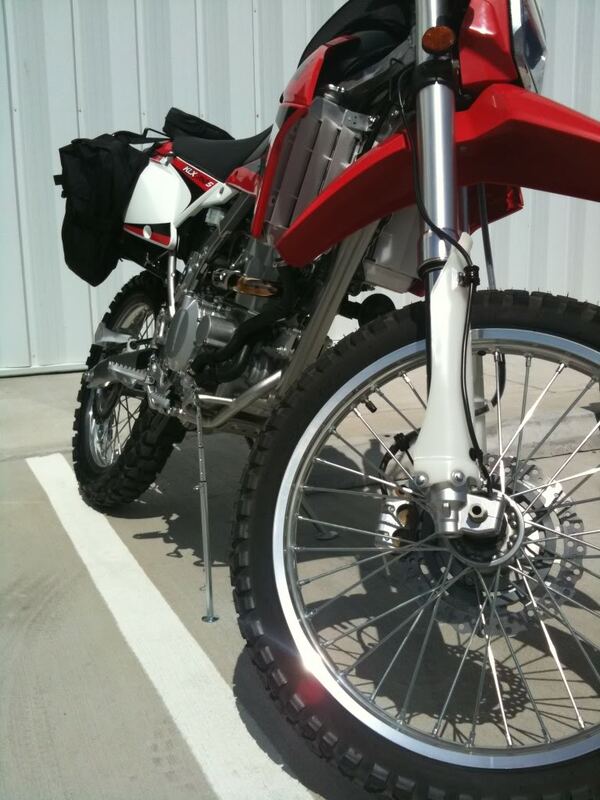 I do have pics lifting a KLX250 I'll post later. You bet, I always try to ship the same day if at all possible and USPS Priority mail is great 2-3 days anywhere in the U.S. including Alaska in 3 days! I had to drill a hole in my TT skid plate to lift the front. Worked great for holding the bike up while I removed the front wheel to change the tire. I'll try to post a pic of where I put the hole later. If you have a pic of lifting the front of lifting your 950 Super Enduro please post it! The only one I have is lifting the rear wheel for a flat fix on a 950 SE.